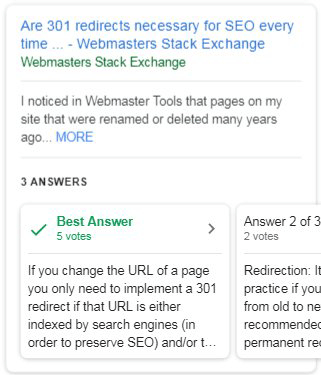 Several folks on Twitter are notifying me of a new Google search feature where Google is showing a box for "best answer" with other answers following directly below search results snippets. This is mostly coming up for Stack Exchange results, where there are multiple answers to a forum post question. 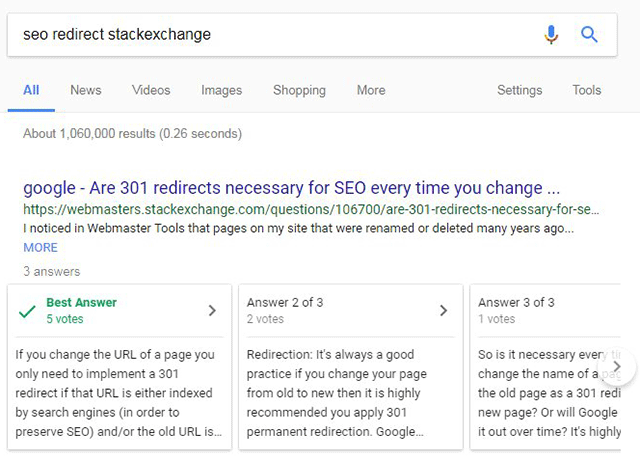 Google shows a carousel of answers, with the "best answer" labeled first as such, and it allows the searcher to swipe or click through the answers directly in the search results. Here are screen shots of both from Glenn Gabe on Twitter but @LukeRedding was the first to notify me of this and then @aroth26 but Glenn had both mobile and desktop screen shots. Of course, Google wants searchers to get the answers on the search page and not have to click through. The webmaster/publisher wants searchers to click through so they can monetize their content.